The Kenner, LA of the early post-war period was a wonderful place to grow up, but forms of entertainment in Kenner back then were somewhat limited and often locally-generated. We had one local movie house on the corner of Minor and Fourth Streets. A second was built in the fifties. We had our parades; that would be St. Rosalee. The Veterans of Foreign Wars cranked up after the war, and out of that came a carnival krewe called the Knights of Malta. They didn’t parade but they did do a nice Mardi Gras ball at a hall connected, if I am remembering right, to the Raziano restaurant and bar on Airline. About once a year a “circus” would come to town. It consisted of a few lame rides (by Pontchartrain Beach standards) and a bunch of game booths designed to take your money and give you a cheap stuffed toy if you actually won, which was rare. The circus set up in the (then) empty lot where the OLPH school is now. Back then it was a full vacant block where we played baseball and football as kids. The best part is it was only a block from my house. With a dollar in change in my pocket, I would have the time of my life at that traveling circus, seeing and doing things that I never got the chance to do without a trip to Pontchartrain Beach, which was very rare. That usually lasted for a few days before they packed up and moved on to another town. Of course, Kenner High football and basketball games were big sports draws for the locals. No Saints back then, and LSU or Tulane sports required a road trip, especially LSU games, or a gathering around the warm glow of a radio. Live telecast? Didn’t happen. There were various dance reviews, plays, very non-PC minstrel shows, and other entertainment gatherings usually held in the Kenner High School gym, and one such event is where this story is going. Bet you didn’t know that Kenner had a bunch of men who liked to dress up as women? I’m not kidding! Transvestites, right here in River City—I mean Rivertown. 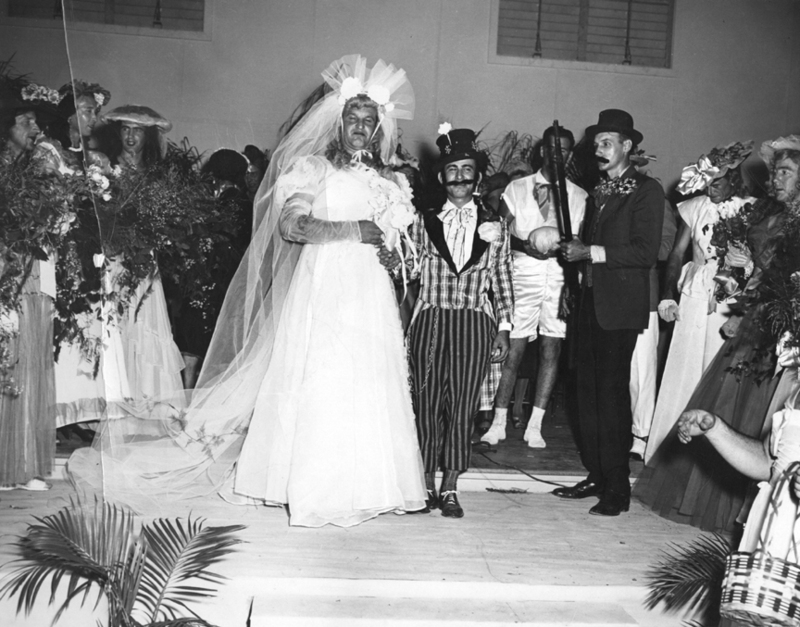 The event was a play called “A Womanless Wedding.” It was a so named because it was indeed a wedding without women presented by a bunch of men in drag. I dearly wish I could remember more details about it. All I have is this old photo I found in my Mother’s stuff. I do recall it was held in the then-new Kenner HS gym, and the men in drag dressed in the old gym, which became a cafeteria for the school. I recognize some in the photo. Dave Goldberg was the bride, who evidently was “pregnant” by the groom in the snazzy suit, who I think was Eddie DiGerolamo. Bobby Cristina (my FIL) is the bride’s father with the shotgun. (“Shotgun wedding.” Get it?) The three bridesmaids over on the left are Bob “Son” Manard (near) and Joe Fletcher (far), but I’m not sure who is between them. I originally thought it might be Bob Schuyler. I have been unable to identify any of the others. With this bunch, the “wedding” must have been a hoot! One possible ‘splain for the ‘men-as-women’ shtick could be that it was a carryover from the shows they’d put on for themselves in-theater. When I started the read and ran across the acronym of ‘OLPH,’ my first thought was ‘Our Lady of Public Health’ … This is a great time trip, btw – we din’t have anything like it in Uptown. I assume you figuered out it was Our Lady of Perpetual Help? I remember hearing about it as I was only 2 years old. Several pictures of it were in an old album that I can no longer find. Three years later, 1952, Kenner became large enough to be considered a “City” and was so designated.